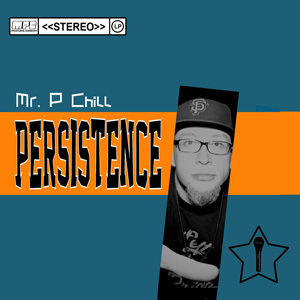 Persistence is the latest release by long-time Sacramento Hip-Hop fixture, Mr. P Chill. Taking a great deal of pride in his "real hip hop" approach, Persistence rocks an old school vibe evoking beats and samples bringing to mind both late 80s Harlem and early 90s Southern California. I'm like 40, how can I still be at it? But far from being a re-tread of rhymes already rapped, Mr. P Chill brings his game with a whole new level of socially conscious lyrics. "I Know That You Hate Me" expresses indifference toward judgment, blasts crooked promoters and bogus gangster rappers. "Thunder Clap" stresses progress, empowerment and change, calling out those who won't stand up for what's truly important. In much the same way that Fat Joe or Heavy D used their size to its advantage, lyrically, Mr. P Chill keys in on his age, wisdom, and complete lack of concern for how his image is perceived. He calls out his own longevity, age, weight loss, and past financial woes, with "Promises" lyrics revealing Chill's overcoming of credit card debt. we all came to have a good time But Persistence is about more than preaching the sermons of the Old School. Chill is also about finding happiness within yourself. While I initially hoped "Good Times" was an ode to the great Jimmy Walker sitcom, the 80s R&B / L.L. Cool J-esque smooth groove pokes fun at Macklemore and reaches back to Chill's own lyrical mentors. Mr. P Chill also pays respect to his wife. Referring to "Mrs. P Chill," both "Promises" and "The Woman Beside Me" are the complete opposite of Hip-Hop's notorious and generalized misogyny. Chill loves his woman, and praises her so openly and personally in a way you just don't hear in music these days. At times, "Persistence" seems to pay a bit too much homage to its inspiration. Some of beats channel a bit too much of a particular era—there's a fine line between channeling influence and taking the old and re-creating it in your own way. But then Mr. P Chill throws in a sample of Janis Joplin, and makes you smile. His rhymes are intelligent and honest, as much as you want in any artist today. And Mr. P Chill's experience shines through. He's clearly been around and playing the musical game for years. Only now, he's not playing any more. He's creating out of a love and respect for Hip-Hop. For Mr. P Chill, his lifelong persistence in itself have been funneled into an aptly titled new album. Persistence hits the streets June 3, 2014. Pre-Orders will be available on iTunes in mid-May.